Grace and Tippi are conjoined twins. They share the bottom part of their body and therefore they're always together. Their characters are different and they have their own style. They get along well and are happy in each other's company. Their situation is normal for them, but when they leave the house they're being stared at, they're getting the rudest intimate questions or people ignore them. Because of this their upbringing was protective and their parents managed to let them be homeschooled for many years. However, the money has run out and Grace and Tippi have to go to a regular high school instead. Being a teenager and finding a way to belong is already difficult when you aren't conjoined and for Grace and Tippi there are extra obstacles. Fortunately they find two amazing friends and have the chance to do regular teenage things. While they finally have some fun something unexpected and life changing is about to happen and Grace and Tippi will be forced to make the hardest choice they've ever made. One is a beautiful story about two amazing girls. Grace is sensible and kind. She dreams of being in love. Tippi is matter-of-fact, caring and easy to influence. I liked both of their characters, they're strong, brave and resilient. I loved that they talk about everything, they don't steer clear of difficult subjects, and that they're also prepared do things they don't particularly like when one of them badly wants something. They're extraordinary and the way the book has been written makes them even more fantastic. I loved that Sarah Crossan has chosen to write her novel in free verse, it adds an extra emotional layer to the story. It's beautiful, raw and honest and it touches the core of what she wants to say. One is a brilliant book. It's been written with empathy and sensitivity, but it's direct and realistic at the same time. There are happy and sad moments, there are tears and joy and worries and hope and it was so easy to laugh and cry with the main characters. 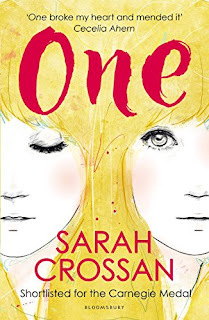 I love books about sisters and Sarah Crossan's main characters are very special. This adds an extra dimension to the story. Her stunning sentences are thoughtful and deep and she shows what it's like to be a teenager while having a disability in an impressive way. Grace and Tippi have the same fantasies, dreams and insecurities as any other teenager, but they are also conjoined. I liked that their handicap isn't what they are, but just part of them, which is exactly how it should be and I applaud Sarah Crossan for noticing this and making it a key part of her work. Everything together makes One is an absolute must-read, I highly recommend this mind-blowing story. One is a book that should be read by both teenagers and adults. It's one of those touching stories that will stay with you for a very long time. It sounds really interesting, a great read. I absolutely loved this. It was beautiful, compelling, and I cried at the end. I can't even put my love for this book into words. Wow, this book sounds wonderful. I love books that have realistic characters in them. I am definitely putting One at the top of my TBR pile. I liked the review, sounds like a great read. What a unique premise! It is hard to believe that conjoined twins would be expected to just integrate into high school. . . it's hard enough as is! Thanks for the review. No way! Hats off for the originality. This is definitely a unique plot. Sounds good. This is the first I had seen of a book about conjoined twins. Sounds remarkable in that it depicts the lives of two separate people joined as one. Great review. Happy Holidays! I haven't read it yet, but it sounds like a real emotional ride. I love these kind. Thanks for the review, Suze. Sounds like a wonderful book to read. Thanks for the review, Suze! I can't imagine how difficult this life must be! What a great topic to bring to light. It's certainly a novel perspective on life. I can't even begin to imagine how difficult even the little everyday things must be for those who are conjoined. What if they don't like each other? I can honestly say that I have never read anything like this story before. But it sounds interesting. This book sounds very good, I am looking forward to reading it and getting to know Grace and Tippi.